Whether for protest or gloating, LSU and Saints fans are a billboard-heavy people. Here’s a list. Supporters of the New Orleans Saints, LSU Tigers, and other Louisiana teams love putting up billboards, especially ones in other cities. A billboard in Houston to celebrate an Astros World Series? Done. A billboard in Denver to celebrate an LSU alum’s batting title? A need. Want to sign LeBron James? Yep. Suffer a devastating loss in the NFL playoffs (no, the previous one)? Time for billboards of encouragement. Louisianans will celebrate anything with billboards, all the way down to hiring some assistant coaches. But we’re here today to discuss a specific kind of Louisiana Billboard All Over The World: the kind launched across the continent to deliver a message of spite in enemy territory. USC ranked No. 1 in 2003’s final AP poll, yet LSU beat Oklahoma in the BCS title game. How’d that happen? College football has been stupid since the year 1869. Next question. LSU fans simmered as USC won 2004’s national title and powered toward 2005’s, with Trojan talk of a threepeat ringing in the air. So the Tigers struck as soon as Vince Young ended USC. 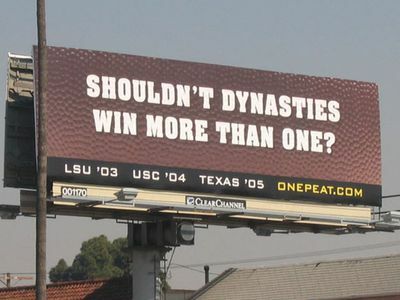 Onepeat.com, home of the Los Angeles billboard project, was registered on January 6, 2006, as few as 24 hours after USC lost to Texas. 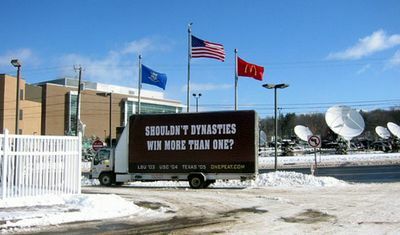 LSU fans’ USC thing also included a “mobile billboard truck” lapping ESPN headquarters. College football fans spend a lot of time stressing over which teams ESPN thinks are the best, you see. Again, this was more than three years after USC and LSU split national title claims. Spectacular! We’re putting up a billboard for two weeks in Birmingham, AL, the home of SEC headquarters, to let them know it’s time to #FreeDevinWhite. A downtown Birmingham billboard will cost $2305. An I-65 billboard will cost $1845. We’ll fund as many billboards as possible, with any excess funding going as a donation toward the LSU School of Veterinary Medicine, in honor of Devin’s love of horses. Here’s a look at one of the #FreeDevinWhite billboards. No game from the upset-filled 2007 stands in starker contrast to today’s standards than ULM 21, Alabama 14. The Tide, which claimed 12 national titles at that point, and Saban, who’d won one at LSU, were 25-point favorites against the .500 Sun Belt team with a tiny budget and zero postseason history. The unthinkable loss was the third of a four-game losing streak to end Saban’s 7-6 inaugural season. 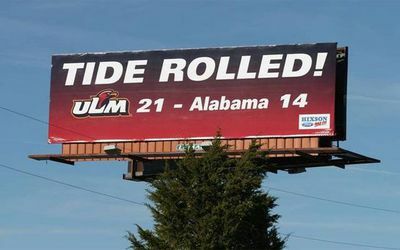 Fans likely remember the smack talk provided by Auburn, which beat Alabama for a sixth consecutive time one week later, and on its way to play in the Cotton Bowl, helped fund billboards on Interstate 20 in Monroe. Bama fans saw it on their way to the Independence Bowl (again) vs. Colorado. Putting up visuals is a common recruiting tactic in college sports, and LSU is always happy to put up as many visuals as possible. This makes the list because it’s absolutely a way to plant a recruiting stake in rival territory. All but one of those signs went into hotly disputed SEC recruiting turf. After another brutal playoff loss of their own, Saints fans once again funneled their billboard energy toward the home of the Falcons, this time after missing out on playing in the Super Bowl there. A Louisiana car dealer reportedly put up 10 billboards throughout Atlanta to protest the worst of several bad calls in the previous weekend’s NFC Championship. 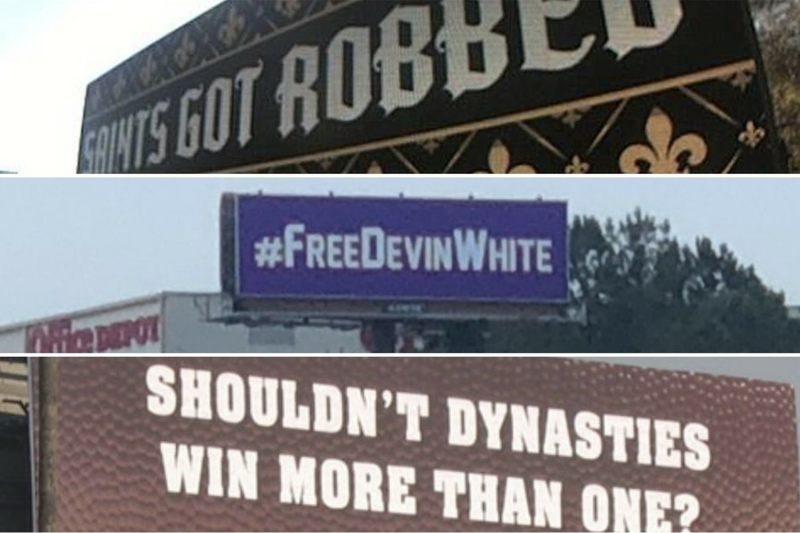 Like when USC fans strived to buy a sign in Baton Rouge, Bama fans responded to the Devin White sign, or Ole Miss fans turned a bizarre internet joke into a New Orleans billboard. But in the end, nobody else has the passion for this that Louisianans possess naturally.